“As currently written, SB 827 would effectively rezone most of the L.A. Basin — from the Hollywood Hills to the 105 — and large swaths of the Valley,” Winter said in a statement. On the morning of Dec. 4, Alexandria, Virginia-based Realtor Abraham Walker received an email from the Northern Virginia Association of Realtors (NVAR) stating that Walker had violated the National Association of Realtors’ (NAR) Standards of Practice for advertising. Those standards, 12-5 and 12-9 of the NAR Code of Ethics, require agents to clearly disclose brokerage associations in all advertising and licensure information on their webpage and other marketing platforms. The notice came with screenshots of Walker’s Facebook page and website, provided by the anonymous tipster who reported him, along with a notification of that the violation would cost him $450 — $150 of which would go toward administrative fees. Before and after of Walker’s website. Walker immediately renamed his Facebook page from “Ask A Walker A Northern Virginia Real Estate Company” to “Ask A Walker powered by Keller Williams Realty Kingstowne” to highlight the brokerage affiliation and added his and his wife’s licensure information to the footer of their webpage. Walker says although he didn’t have the brokerage name included in his original Facebook page name, he’s always listed his brokerage affiliation in the story section of the about page. The “Ask A Walker” Facebook Page about section. Walker paid the fine, and he then decided to share his story on Raise the Bar in Real Estate, hoping to prevent other agents from making the same mistake. “Learn from my mistake,” he concluded. NAR’s Code of Ethics standards for advertising. Walker shared before and after photos of his Facebook page and website to show the changes he made. Many commenters thanked Walker for his transparency, saying they weren’t aware of the advertising requirements and planned to immediately update their Facebook pages and websites. Other commenters focused on the $450 fine, which they felt was unfair — especially since Walker didn’t receive a compliance warning first. NVAR caught wind of the conversation on Raise the Bar in Real Estate and held a Facebook Live event that explained how the NVAR citation system works. Two grievance committee members — Dallison Veach and Frank Dillow — explained that consumers and Realtors alike can file a complaint, and the validity of that complaint will be examined based on the NAR Code of Ethics as well as Virginia’s Department of Professional and Occupational Regulation (DPOR)’s advertisement requirements. They also made it clear that committee members are not eligible to file complaints, responding to conversations in a private Facebook page for Northern Virginia-area Realtors that implied NVAR board members were filing complaints and doling out fees to increase NVAR’s revenue. When it comes to Code of Ethics violations and the subsequent fines, Veach and Dillow explained the system “isn’t set up to give a warning,” but rather to determine if there’s been a violation and fine Realtors on the first offense. Furthermore, NVAR says the current citation system was voted upon and approved by the Board of Directors for the six local Northern Virginia associations, which include Arlington County, Fairfax County, City of Fairfax, City of Falls Church, Town of Vienna and the City of Alexandria. In order for the current system to be changed, members would need to make a request that would “work its way up” to the Professional Standards Committee as a recommendation to the Board of Directors. Lastly, Dillow says that switching to a warning system would disproportionately shift the cost burden to the association considering the man-hours it would require for the complaint to travel through the grievance process and for committee members to decide to give a warning or charge a fine. Dillow and Veach also said members always have the option to keep one another accountable by quickly pointing out violations rather than filing a formal complaint. NVAR also noted that brokers must bear some of the onus for educating their agents about proper advertising practices. “We look to the brokers, and say, ‘Hey, you should be educating your agents and monitoring the advertising in your office,’” said Veach before listing the array of educational tools NVAR provides to agents and brokers. She also suggested that agents, especially new agents, reach out to their brokers to get guidance about advertising standards. But according to commenters on Walker’s post, brokerages and associations alike could be doing more to educate their agents on advertising standards and provide specific examples of what compliance looks like. “NAR and state associations want us to include both brokerage and state licensure on all media, then frankly they should spend more time and effort educating us on it than the [stuff] we’re subjected to on an annual basis,” wrote Bo Bromhal. NAR general acting counsel Ralph Holmen says the association doesn’t provide “explicit, articulated guidance on how exactly [advertisements] have to be done.” Instead, NAR relies on agents and brokers’ ability to properly interpret and execute what “reasonable and readily apparent manner” means for their advertising materials on all platforms. “If it’s in a tiny two-point type at the very bottom corner of the page where it wouldn’t be easily visible, then it obviously wouldn’t satisfy that standard (12-5 and 12-9),” he said. When it comes to some NVAR members calling to give a warning citation rather than fine on the first offense, Holmen says he doesn’t believe associations have an “obligation” to provide a warning, and that it’s ultimately up to the association to decide the best method for handling violations. NVAR senior director of communications Ann Gutkin says the association is doing all it can to ensure members are in compliance with NAR and DPOR advertising standards, such as offering digital and print articles as well as subject-specific videos on the NVAR site and YouTube channel. Furthermore, Gutkin says members are encouraged to call the online legal hotline to get advice from staff attorneys. Although Walker believes NVAR needs to provide “more clarification” on how to meet standards, he says his brokerage has tried to be proactive. On the day he received the fine, his brokerage sent reminders on NAR and DPOR advertising standards and has helped revise everyone’s Facebook pages, websites and other marketing materials, changes he hopes will prevent another $450 fine from coming his, or his colleagues’, way. New home sales soared 18.9 percent in September. Economists surveyed by Thomson Reuters anticipated new home sales falling 0.9 percent for the month. New home sales unexpectedly fell 3.4 percent in August. A new home is constructed on July 26, 2017 in Miami, Florida. Sales of new U.S. single-family homes unexpectedly rose in September, hitting their highest level in nearly 10 years, offering hope that the housing market was regaining speed after appearing to stall in recent months. The Commerce Department said on Wednesday new home sales surged 18.9 percent to a seasonally adjusted annual rate of 667,000 units last month amid an increase in all four regions. That was the highest level since October 2007 and followed August’s upwardly revised sales pace of 561,000 units. For decades, home appraisals have been a standard feature in a home sale. Now a borrower may no longer need one when buying a house with the nation’s most popular loans. The government-sponsored enterprises (GSEs) Freddie Mac and Fannie Mae have announced they won’t require a traditional appraisal in some home-purchase deals beginning next month. The enterprises will use big data and their automated tools to confirm the value of select properties. The GSEs, which finance roughly half of all home loans made by lenders, have accepted automated appraisals in some home refinances. It will be possible to skip a full-blown appraisal in a home purchase for eligible properties after Sept. 1. Fannie and Freddie’s initiatives are similar in a number of ways. Sales involving single-family homes and condominiums, including second homes, could be eligible to skip the appraisal. A number of property types won’t be eligible, such as investment properties, two- to four-unit homes, or homes located in previous disaster areas. To be eligible for an appraisal waiver, borrowers also will have to chip in a healthy downpayment of at least 20 percent on the home. The move could prove to be controversial, however. “We have significant concerns about it,” said Jim Amorin, president of the global trade group, the Appraisal Institute. “We think it is going to result in a race to the bottom, create a lot more risk for taxpayers and be a significant issue for the taxpaying public in the not-too-distant future,” he told Scotsman Guide News. Amorin said the GSEs have gone down this road before to bad results. In 1994, bank regulators exempted loans sold to Fannie and Freddie from requiring a full-blown appraisal. The GSEs ultimately loosened their standards, and granted appraisal waivers on a significant number of the loans purchased by the enterprises up to the time of the last housing crash and financial crisis, when the GSEs were bailed out and taken into conservatorship. Post-financial crisis, the GSEs have required a traditional appraisal on nearly all purchase loans. Since the crisis, new federal rules on the industry have tightened standards to ensure the accuracy of an appraisal, and have kept appraisals at an arm’s length from lenders. Amorin said Freddie has indicated to the trade group that it could grant waivers on up to 35 percent of its loans, whereas Fannie has been more conservative and less than 10 percent of its loans will be eligible. He said that the industry will continue to push the GSE regulator, the Federal Housing Finance Agency (FHFA), to clamp down on the use of appraisal-free mortgages in property sales. In a June letter to the FHFA, the Appraisal Foundation, which establishes federally-mandated standards for professional appraisers, said it was “a step 180 degrees in the wrong direction.” The organization also said the moves are poorly timed. Fannie and Freddie are rolling out these programs at a time when homes may already be overvalued. “Frankly, using ‘backward-looking’ data to project a property’s value based on transactions that occurred at the height of a market creates a recipe for disaster,” the Foundation letter says. The Foundation asserted that while live appraisers do use historical data, their expertise is needed to recognize market shifts. The Foundation also expressed concern that Fannie and Freddie don’t appear to have adopted identical criteria to allow for a waiver. Appraisal experts told Scotsman Guide News in June that automated appraisals using computer modeling will likely become more common in housing sales. The current technology, however, tends to yield accurate results only for newer houses in neighborhoods with similar property values. These tools are not as successful in evaluating older properties, or in neighborhoods with a lot of variation in the housing stock. Also, automated valuations aren’t likely to work in rural and remote areas with sporadic property sales, where it often is difficult even for a live appraiser to get a handle on the property’s worth. Karen Mann, the owner of Mann & Associates and a working appraiser in Discovery Bay, California, said a number of factors that determine a property’s value can be easily missed by statistical modeling, such as if a school district boundary moves. Mann, who spoke to Scotsman Guide News on behalf of the American Society of Appraisers, said that the GSEs have been able to do this now because the market has been on an upswing. In a news release on Friday, Freddie said it will use its automated-collateral evaluation tool to determine whether a property is eligible. That system sorts through multiple listing data, historical sales and public records to determine whether the value is in line with a lender’s estimate. Freddie said that it could save borrowers up to $500 and cut down on closing times by seven to 10 days. This story was updated from the original version to include comments from the Appraisal Institute and American Society of Appraisers. Government-sponsored mortgage giant Fannie Mae will raise its debt-to-income limit from 45 percent to 50 percent on July 29, 2017. This would increase the pool of approvable borrowers for home sellers, and allow homebuyers to spend more. The decision came on the heels of a study that concluded higher DTI ratios don’t increase the rate of mortgage default. 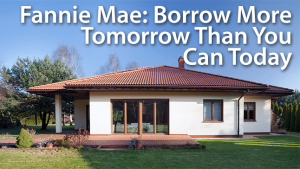 Fannie Mae researchers examined over 15 years of data from borrowers with DTI ratios between 45 and 50 percent. They found that many of these borrowers had good credit and were not likely to default. This change is a big deal, because according to the Washington Post, a too-high DTI is the most common cause of mortgage denial. Your debt-to-income ratio compares your gross (before tax) monthly income to your total monthly debt payments on all debt accounts. Accounts include auto financing, credit cards, and student loans, plus the projected payment for the new mortgage. If you earn $4,000 a month, previous guidelines allowed you to have total payments of $1,800 per month. If you had accounts totaling $700, your housing expense, including mortgage principal, interest, taxes and insurance (PITI) couldn’t exceed $1,100 per month. After July 29, you’d be able to have payments totaling half of your gross income. If you earn $4,000 a month, you can have bills and housing payments up to $2,000 a month. If your other payments equal $700, you could qualify for a PITI of up to $1,300 a month. How Much More Can You Borrow? The new change will let some applicants with DTI ratios over 45 percent borrow more. How much more? That depends on your income and monthly debt. You can see how allowing higher DTIs would increase what people can borrow. The borrower in the example above, earning $4,000 a month, can spend up to $1,100 a month for housing. Under new guidelines, the borrower can spend up to $1,300 a month. Assuming that taxes and insurance come to $250 a month, this homebuyer can pay $850 a month for PITI under the old guidelines, and $1,050 under the new ones. At a four percent mortgage rates, you could borrow $178,000 under the old rule. And $220,000 under the new one. That’s a loan amount over 20 percent higher! Who Qualifies For Larger Loans? To qualify for a mortgage with high debt-to-income ratios, you’ll need a strong application. That usually means a substantial down payment, or really great credit scores. Another plus is having savings after you close on your loan — enough to make several months’ mortgage payment if your income stops temporarily. You’ll know if you qualify in seconds, once your loan officer or broker submits your file for automated underwriting. That’s the beauty of Fannie Mae’s Desktop Underwriter software. You can get a decision quickly. In addition, your lender can run the program again and again. You can try out several scenarios until you find a way to get approved. Current mortgage rates edged up slightly after James Comey testified and the White House didn’t burn down. Political and economic uncertainty in Europe has been affecting interest rates here, but investors have remained optimistic about US markets. Stocks ended yesterday with mixed results, changes that you’d not expect to warrant a major change in mortgage rates. The cash-out refinance allows homeowners to pay off not only their own student debt, but any debt they took on for their kids’ education. In September 2015, the California Bureau of Real Estate (CalBRE) issued an advisory which was captioned “Disciplinary Warning to Real Estate Salespersons Who Act, Conduct Themselves, and/or Advertise as ‘Independent’ Real Estate Professionals — and a Simultaneous Caution to Brokers Who Allow or Support Such Practices”. Licensees of CalBRE are well advised to review that prior advisory since we continue to see some of the same bad practices identified in that writing. This discipline “advisory” is being issued as a supplement to that prior warning since CalBRE has taken notice of the use by some real estate salespersons of names and designations (and attendant Internet and marketing materials) that suggest to the public – and mislead consumers into falsely believing – that such salespersons are real estate brokers. A scenario that we have repeatedly seen is the use by a salesperson (who for this illustration we will identify as John Doe) of a fictitious business name that would lead members of the public to incorrectly believe that the business is operated and managed by a real estate broker. In this example, salesperson Doe conducts business using the name Doe Real Estate. Doe advertises using that business name, and the advertisements are connected to, or accompanied by, a webpage and other materials that extol the virtues of Doe Real Estate. The public would not think that Doe is a salesperson who must be supervised by another, and would most certainly conclude that Doe Real Estate is a real estate broker or brokerage. And the above practices are unlawful. In addition to the above, many salespersons continue to brand and identify themselves as “independent” real estate practitioners, and they practice and advertise as such. Unless those salespersons are operating as “teams”, in full compliance with the California laws and rules pertaining to teams (e.g., the disclosure of I.D numbers and the name of responsible broker, and the surname of at least one of the licensee members of the team along with the use of the terms “team”, “group” or associates” with regard to the team), that is unlawful as well. Further, and depending on the specific language employed with respect to the name(s) and designation(s) used by the real estate salespersons, there might be a violation of the law relative to the use of fictitious names. Please see the prior guidance given by CalBRE on the proper use and licensing of fictitious names. As was also stated in the prior warning, under California law, with its two-tiered licensing system, real estate salespersons cannot provide – or advertise that they can provide – real estate services independently of their responsible brokers. Likewise, salespersons must be associated or affiliated with, and be reasonably supervised by (which supervision includes broker review of the advertising used by the broker’s salesperson or salespersons pursuant to Commissioner’s Regulation 2725(e)) a responsible broker in order to engage in real estate licensed activities in California. The law provides no exceptions. CalBRE will take appropriate disciplinary action (including the imposition of significant fines, and – where appropriate – the revocation of licensure) against real estate salespersons who engage in the unlawful activities discussed above, and against real estate brokers who permit their salespersons to engage in such activities.